Celebrate the holidays with us this season! We're excited to host a variety of festive evenings filled with delicious food, good music, and classic holiday films! If you’re looking for a way to give back to your community this month, dining with us is a perfect way to show support for our mission and help support your neighbors! Join us for dinner, and if you're able, pay it forward to help feed our patrons who are unable to pay for their meal. All of our events are free to the public, and dinner will be provided on a pay what you can. Click here to see a menu for the evening. Join us for Seven Guest Chef Dinner at Fork & Spoon from 5 - 7 pm - it's the last one for 2018! 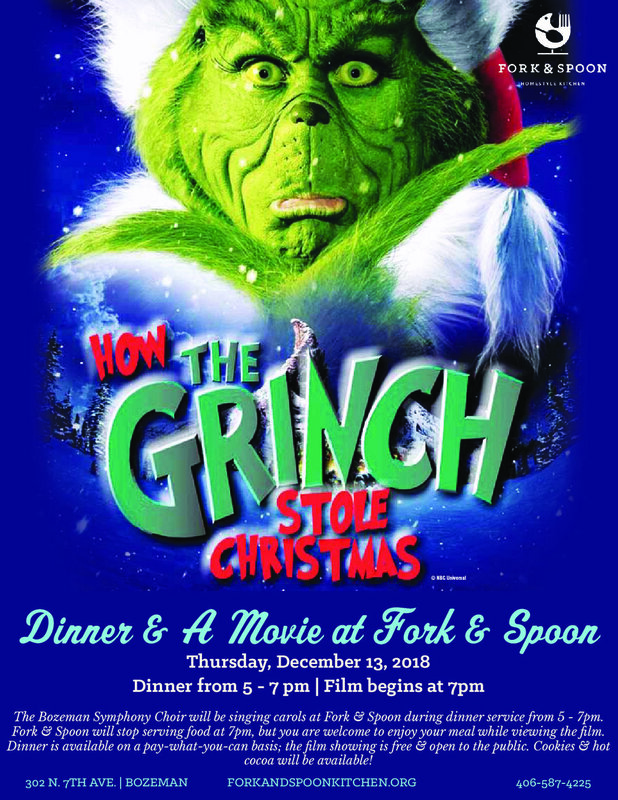 Dinner & A Movie - holiday style! We're excited to welcome the Bozeman Symphony Orchestra & Symphonic Choir for holiday carols to enjoy during dinner service from 5 - 7pm. At 7pm, we'll be screening Dr. Seuss’s How The Grinch Stole Christmas - complete with hot cocoa and ginger snaps! The Do, Ray and Me Clarinet Trio will be serenading Fork & Spoon dinner guests from 5 -7 pm. The Bozeman Symphony Orchestra & Symphonic Choir will join us for a second evening of holiday carols during dinner service from 5 - 7pm.